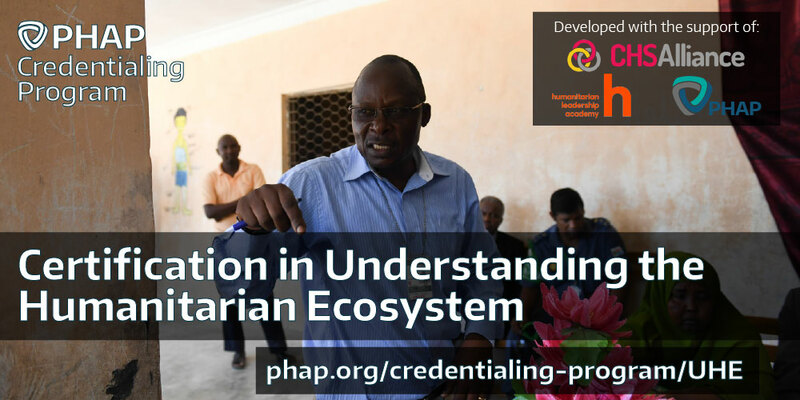 The PHAP Credentialing Program certification in Understanding the Humanitarian Ecosystem (UHE) is designed for humanitarian practitioners and others in related fields who need to demonstrate a comprehensive understanding of the components and dynamics of the international humanitarian ecosystem. The UHE certification is highly relevant for all individuals working in international organizations, NGOs, the Red Cross/Red Crescent Movement, governments, academia and research, as well as others engaging with or working in the humanitarian sector. The UHE certification is a stand-alone certification designed to apply to all practitioners at all levels of professional experience. What is the scope of the UHE certification? A UHE certification holder understands the defining characteristics of humanitarian action, its key concepts and distinguishing features, and its contemporary reform processes and policy frameworks. Certification holders are also able to identify the different actors involved in humanitarian work, as well as the mechanisms and processes that connect and coordinate between them. Lastly, certificants are able to identify contemporary pressures, criticisms, and debates that influence humanitarian action. 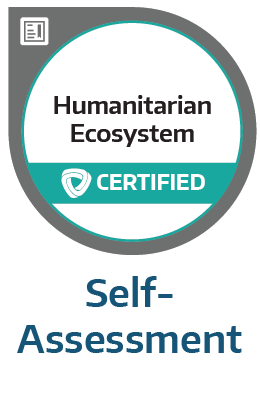 While the UHE certification covers fundamental aspects of relevant legal frameworks and the core humanitarian principles, it is designed to be complementary to the more specialized certifications in International Legal Frameworks for Humanitarian Action (ILFHA) and Applying Humanitarian Principles in Practice (AHPP). 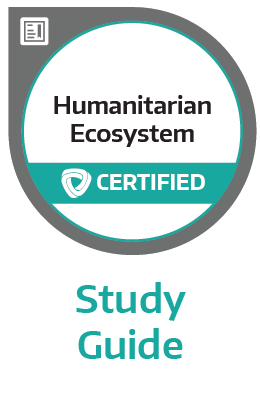 The UHE certification is one of the six modular PHAP certifications that recognize knowledge and skills in complementary areas of humanitarian practice. The UHE certification provides an opportunity for practitioners to demonstrate professional competencies within the scope of the certification. Employers in the humanitarian sector are increasingly using the certifications in their professional development and recruitment. All certified individuals receive a verifiable digital badge as proof of their achievement that can be added to their CVs, social media profiles, email signature, or personal websites and portfolios. How do you prepare for the certifications? Candidates may prepare themselves for the certification assessments in any way they choose and no specific courses are required. The Self-Assessment outlines the scope of the certification and the specific required competencies for certification holders. The self-assessment is a useful tool to help you reflect on where you have the greatest need for improvement. The Diagnostic Test is a free online test that is similar to the official certification assessment, but designed to help pinpoint where you may need to prepare further. This diagnostic test gives an indication of how you would score on the official certification. Upon completion, you will receive a personalized and detailed Diagnostic Report, indicating your strengths and weaknesses in the different areas of the certification. The Study Guide provides overviews of key concepts, links to relevant learning resources, study questions and scenarios, structured around each individual competency required for the certifications. To optimize your preparations, you can use the Self-Assessment and Diagnostic Report to identify the specific competency statements for which you still need to prepare and then refer to those chapters in the study guide. 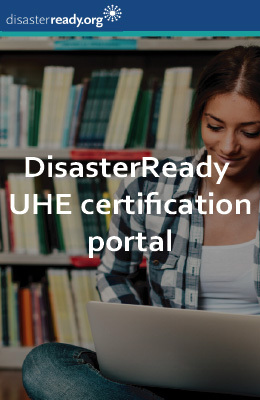 DisasterReady offers personalized learning plans based on the PHAP Diagnostic Test and resources to help prepare for the UHE certification. What does the UHE assessment entail? Obtaining the UHE certification requires passing a rigorous 60-question multiple-choice assessment. 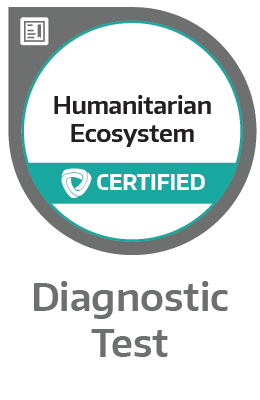 This assessment is made by and for humanitarian practitioners according to the highest international standards for developing professional certifications (ISO 17024:2012). The certifications can be taken 24/7 through any computer with a stable internet connection and webcam. Each certification assessment credit costs USD 80 (USD 65 for PHAP members) and includes a free re-take in case you do not pass on your first attempt. Are you ready to sit for the certification assessment? As a proud member of ICE, we stay informed on best practices in developing and administering quality certification programs so that we may better serve you. PHAP is proud to be a member of the Institute for Credentialing Excellence in show of our support of the credentialing community and our commitment to strive for excellence in our certification programs. The PHAP Credentialing Program is made possible through the Practitioner Competencies Learning Center, a joint initiative of the Humanitarian Leadership Academy, CHS Alliance, and PHAP working to develop solutions that strengthen competency-based approaches in the humanitarian sector at the individual and organizational level.